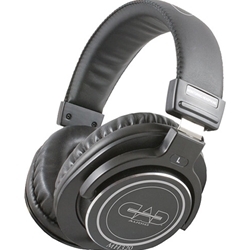 The CAD MH320 - Closed-Back Studio Headphones are constructed from stainless steel, manganese, and aluminum with 45mm neodymium dynamic drivers to deliver an extended frequency response of 10 to 26,000 Hz and a sensitivity of 101 dB into a 36O load at up to 2000 mW power handling. The closed-back circumaural design helps isolate sound while tracking, mixing, and mastering. The leather earpads are outfitted with high-density memory foam for improved comfort during long sessions working in the studio.